Many elderly people have had cats years. Often there comes a time when having a real cat is too demanding for them, or perhaps they need to move to a care home. Sadly many homes do not allow them and the loss of a familiar pet can have wide-reaching implications, especially for someone with dementia. 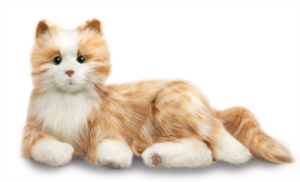 One ideal situation is a lifelike pet cat that is actually a toy. I attended a care exhibiton today in my home city of Exeter, Devon. It was the first of its’ kind for a decade and these cats were there. I had visited the stand to meet Pepper the Robot but it was the cats that I really liked. I am always asked for ideas for gifts for people with dementia, so they caught my eye. Joy For All Companion Pet (brand trade name) cats look, feel, and sound like real cats. Well nearly, but they are very tactile. These pets are much more than soft fur, soothing purrs, and pleasant meows. They are quite lovely. The soft cats respond to petting, hugging, and motion much like real cats do know. People love their pets. Fact. Having to leave your home and pets behind is a huge challenge. Whilst companion cats are not real they are lifelike. VibraPurr technology further enhances its life-like qualities. This two-way give-and-take relationship helps create a personally rich experience that can bring fun, joy, and friendship to you and your elderly loved ones. These pets won’t cost you a fortune in vet fees and have no need for food or cat litter. Almost an ideal win-win pet, they even roll over for tummy tickle. They cost between £100-£120 which is quite expensive but shared between family members these pets are a lovely gift sure to pacify someone who may be agitated due to dementia. “My family recently had to place my mum in a nursing home for long term care. It was an incredibly difficult and painful decision to make. She has dementia and my 88-year-old father could no longer care for her. We worried about the time she would spend there when no one was visiting or during the periods of time with no activities. Because of his, I got her a joy for all cat. She has always been a nurturer, as a mother and grandmother, and has also loved animals. I am happy to say that this was one of the best purchases I have ever made. She enjoys petting the cat and the reactions she gets from her touch. It is truly remarkable what this cat can do. It is very lifelike and although my mother doe it isn’t real she enjoys it nonetheless. The nurses and care staff are all fascinated with her cat as well! She is the most popular resident in the home!